For the sake of keeping spoilers to myself, and just because there’s not really not much to tell that you can’t figure out for yourself, I’m going to try to keep this short as I have other films where every bit of the story could be giving something away. That is, if you care to begin with. Clyde is a recently divorced dad and he’s got his two daughters for the weekend. It’s a chance for him to stay in touch with his kids as well as get them away from mom’s new boyfriend who seems to be showing Clyde up any chance he gets. After stopping by at a yard sale, the youngest daughter Emily gets a hold of an old wooden box with strange markings on it. Day after day, night after night, Emily is acting stranger and stranger. What is in the box and is Clyde’s daughter even herself anymore? Even as I’m writing the plot, my fingers get tired of writing or even thinking of that base anymore. “Hi, I’m the divorced dad and I’m having trouble reconnecting with my kids after the divorce. Now my kid is acting a bit weird, I don’t know who to turn to and my ex-wife and new boyfriend aren’t helping because they can’t see the problem.” This isn’t just used for Horror and Thriller movies either but Drama as well. The difference is that Horror and Thriller movies throw kids and family into the story just so you have people to care about for the scary parts while Drama focuses on the family entirely. Given the choice, I’ll take Horror but I don’t particularly care for the way families are dealt with in this or others like it: just things for demons and ghost to mess with. Of course the demons and ghosts mess with the family, that’s what makes it scary, right? The problem is that this, along with many others like it don’t ever give you a reason to like anybody except the main character…sometimes. Often times it’s only because we’re seeing things through their perspective and they’re the only ones that know as much as us. Everybody else just continues following their dull routines pretending as though nothing is wrong. Jeffrey Dean Morgan feels likable enough in this as the dad that’s just trying to make things work but c’mon- we know this story backwards and forwards. The good things about the film are some of the moments that actually make you jump- in other words, the parts you’re there to see in the first place. Everything else becomes fodder once the characters are slowly going down the dark hallway in their underwear while hearing weird voices around the corner. Eyes not just rolling but seemingly being pulled into the back of people’s heads, and moths, moths everywhere. Random voices being heard from the body of a little girl who just hasn’t been herself lately; all of these things add for what’s sure to make your significant other grab at your arm or even stranger depending on how fast you acquaint yourself with people you don’t know. A scene of an MRI scan was about the first time I compared this to The Exorcist (the only scary movie as far as I’m concerned) which is a positive in the way a movie about a giant shark attacking beach-lovers could be different from Jaws but as mentioned, it still falls in line with all the others. For some reason, Matisyahu shows up as a rabbi to help get rid of the entity. Funny enough, the ad for this movie shows up before the video in the link right there. Anyway…what was I saying? Oh yeah, this movie, right. I can’t say anything you haven’t heard already. The trailer for Sinister before the screening for The Possession even followed many of the same plot points so I guess there’s that to look forward to. Oh and don’t think they’d forget to add the “based on a true story” line they love to add. If you’re a huge fan of Thrillers and just refuse to miss one, it’s a much better choice than The Apparition but that’s not saying much. Just don’t expect to see anything new. This entry was posted on 08/31/2012 at 2:04 am and is filed under Reviews! 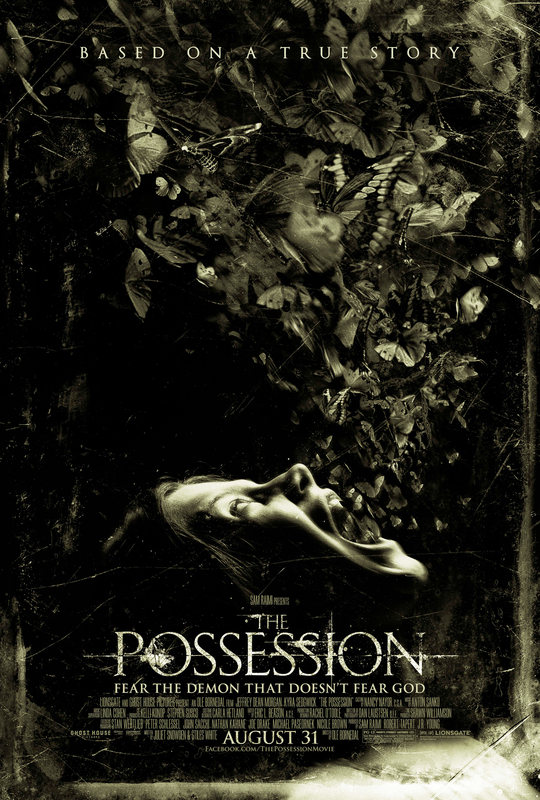 with tags horror, jeffrey dean morgan, reviews, the possession, thriller. You can follow any responses to this entry through the RSS 2.0 feed. You can leave a response, or trackback from your own site.